How often do we miss out on opportunities that are right under our noses? Sometimes the one thing we’ve been looking for all this time has been right in front of us, or in Benjamin and Candice’s case, in the same classroom. While our heads are stuck in our smartphones (or textbooks! ), there’s a whole world happening around us that we may be missing. 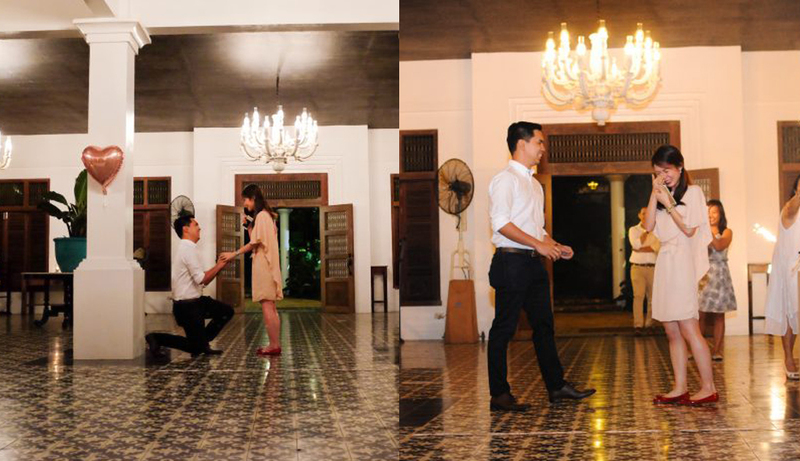 Read on for a proposal story that will make you want to pay closer attention to your surroundings. Benjamin and Candice were law school classmates who had barely exchanged two syllables with each other – Candice at the front of the class, Benjamin at the back – until one day, not long before their graduation; thanks to Walgreens, Facebook and a brother, the two would finally speak. Candice’s younger brother needed a mysterious object that only Walgreens carried. While helping her brother search for ways to bring the product (I’m as curious as you are what that special product was!) to the Philippines, a post of Benjamin in Chicago popped up on Candice’s Facebook newsfeed. She then wrote to Benjamin asking him to bring it back with him, and, as Candice fondly remembers, “the rest, as they say, is history!” It didn’t take long for their law school acquaintance to turn into storybook love. Fast-forward years later, Benjamin lead his girlfriend, Candice one Saturday night into a beautiful cabana and handed her that very same graduation picture (now crumpled with time). He looked into her eyes and asked her to be his wife. “It’s time,” he said. The sparkling James Allen pavé halo engagement ring he proposed with was inscribed with ECC 311. Candice said yes, with tears streaming down her face, while the photographers Benjamin had hired were surreptitiously sneaking shots of the proposal. After their private engagement moment, Candice was further surprised by all of their friends and family, who joined them to celebrate. What do you think of this cabana proposal story? Let us know and congratulate the couple in the comments below!